> Passamezzo Moderno - Founded in 2005, is a period ensemble that performs the music of three centuries, from 1530 to 1830, and specializes in the virtuoso instrumental music of the 17th century. Its members are David Granger, dulcian and bassoon, Jonathan Davis, harpsichord and organ, and Edwin Huizinga and Adriane Post, violins. Bassoon Reed Blank (tip uncut) $12.50. 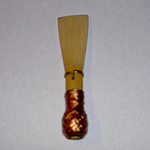 Contrabassoon Reed Blank (tip uncut) $15. Bass Dulcian Reed Blank (tip uncut) $15. Baroque Bassoon Reed Blank (tip uncut) $15. Classical Bassoon Reed Blank (tip uncut) $15. Since each reed is given, and needs, my loving attention, I recommend ordering no more than 12 reeds at a time. Probably best to limit reed blank orders to 20 as well. 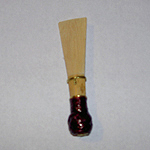 Reeds are sent first class mail. Delivery times will vary. If you are in a rush, don't count on me meeting your deadline. By Credit Card: We process credit card payments using PayPal - click on the "Add to Cart" buttons above to order the specified items. You can also print this Order Form to order. We have chosen a few of our concert recordings for you to listen to. Please click on the links below to download mp3 files. Enjoy! Enter your email address and stay informed about upcoming concerts and events! Passamezzo Moderno is a fiscal affiliate of the San Francisco Early Music Society (SFEMS), a not-for-profit corporation. Your donation, made payable to SFEMS and acknowledged in writing by SFEMS, is tax-deductible to the extent permitted by law. Be sure to type "FOR PASSAMEZZO MODERNO" in the comment line of the donation form, or we will not receive your donation.